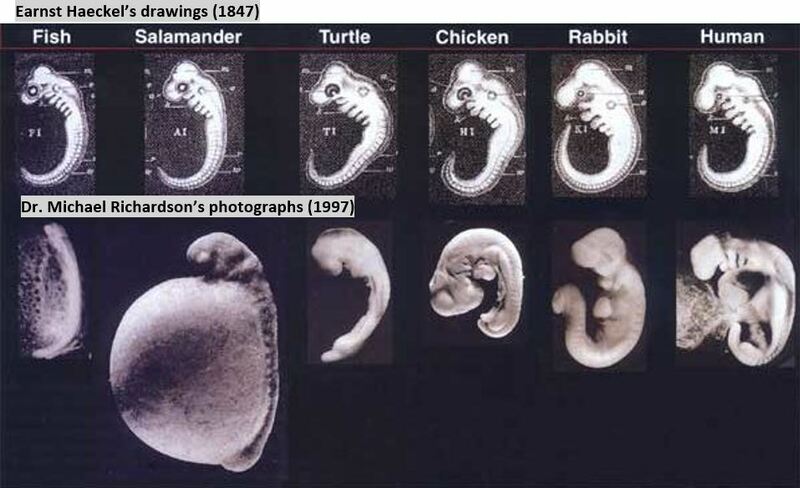 ​Many textbooks have drawings puportedly showing that fish, salamander, turtle, chicken, and rabbit embryos look extremely similar to human embryos. These are based on 1874 drawings done by Ernst Haeckel, Darwin's advocate in Germany, whose evolutionary thoughts were instrumental in the rise of Nazism and its belief in the master race and inferior races. These "similarities" are used to prove that evolution is true. 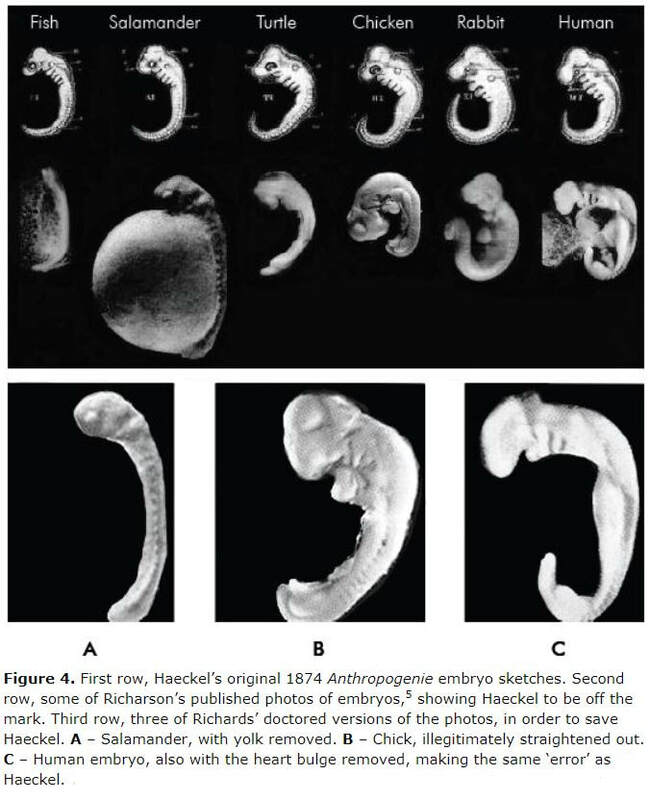 However, in 1997, Dr. Michael Richardson showed ACTUAL PHOTOGRAPHS of the various embryos looked extremely different from Haeckel's drawings. His conclusion? Either Haeckel is a horrible artist or he's a fraud. History has found Haeckel was a FRAUD. At Jena, the university where he taught, Haeckel was charged with fraud by five professors and convicted by a university court. His deceit was exposed in “Haeckel’s Frauds and Forgeries” a 1915 book by J. Assmuth and Ernest R. Hull, who quoted 19 leading authorities of the day. ​There seems to be a systematic attempt to commit fraud in order to have evolution be accepted. However with what we know about the true pictures of fetuses shows no relationship between any living beings. 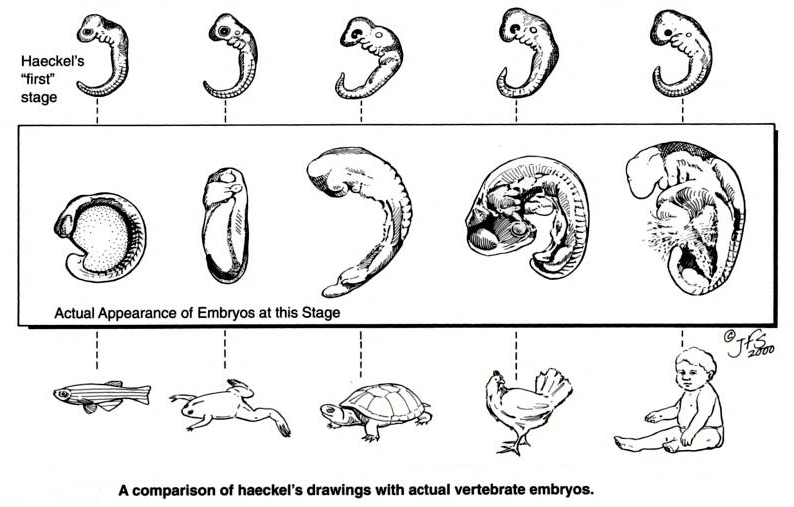 If evolutionist are about science, then they should be up in arms about these FRAUDULENT drawings, which were made solely to convince people that evolution was true due to the similarities of fetal development between fish and humans. Yet evolutionist seem completely ok with this fraud until called out on them. The question every person ask themselves knowing the truth is are you ok with this FAKE PROOF of evolution? Keep in mind this one of their strongest proof for evolution. So why would someone, anyone, continue to print and insist teaching these outright LIES. 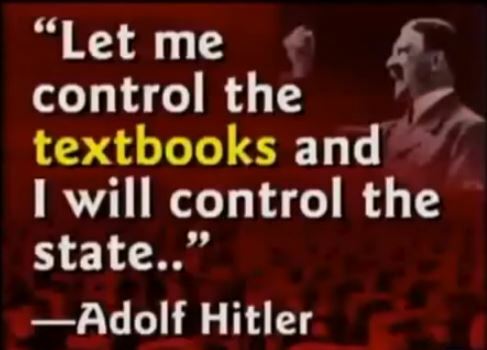 Adolf Hitler probably worded it the best as the state and the people can be controlled by the lies of the textbook. So will you continue with the lie of evolution or look to the Bible who got it right from the very start saying that man was created by an all powerful, all knowing God and that you are not just a random clump of cells. Evolution wants you to think you are clump of cells that came about by random chance/accident. The Bible says you are NOT an accident but rather a purposeful creation of a God who loves you and wants you to live with Him forever. But first in order for you to live with Him, you must be made right with Him and free of all your sinful nature, that always wants to rebel against His order and rules. To be made right with God, you must acknowledge that you are a sinner because of sinful nature and that you need the Saviour, who is none other than Christ Jesus. Lastly and most important is you must accept by placing your faith/trust upon that Saviour Jesus alone. Your works are not good enough to play any part on this. It is the gift of God. This act alone places our sins upon Jesus as our substitute and makes righteous before God. If you wish to accept this free gift from God, pray this prayer and BELIEVE UPON JESUS and be saved.